The Outer Banks are barrier islands off the coast of North Carolina, separating the Atlantic Ocean from the mainland. Their open-sea beaches, state parks and shipwreck diving sites make them a popular holiday destination. Roanoke Island was the site of the first English settlement in the New World, an endeavor sponsored by Sir Walter Raleigh. This National Seashore was authorized by Congress on August 17, 1937. After several land purchase, the park was officially established as the first national seashore on January 12, 1953. There are three visitor centers, each located on a barrier island. The visitor centers offer information about the Cape Hatteras National Seashore, ranger programs, and a bookstore. The Bodie Island Visitor Center is located in the north, adjacent to the Bodie Island Lighthouse, which is open for tours seasonally. The Hatteras Island Visitor Center and Museum of the Sea is located in the Cape Hatteras Light keeper’s quarters, in Buxton, North Carolina. 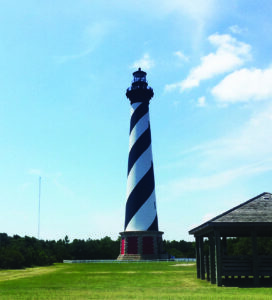 Exhibits include the history, maritime heritage and natural history of the Outer Banks and the lighthouse. Ocracoke Island Visitor Center is located in Ocracoke, North Carolina near the Ocracoke Lighthouse. Fort Raleigh National Historic Site protects and preserves known portions of England’s first New World settlements from 1584 to 1590. It also preserves the cultural heritage of the Native Americans, European Americans and African Americans who have lived on Roanoke Island. In 1937, Paul Green, one of the most renowned Southern playwrights, created The Lost Colony, an outdoor drama based on the first English expeditions to the new world. 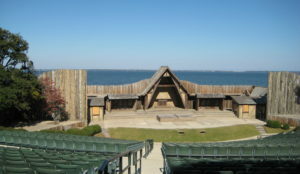 His play is still being performed at the Waterside Theatre on Roanoke Island, North Carolina. 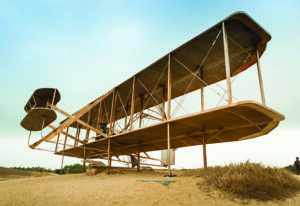 Wind, sand, and a dream of flight brought Wilbur and Orville Wright to Kitty Hawk, North Carolina where, after four years of scientific experimentation, they achieved the first successful powered airplane flight, which lasted 12 seconds and covered 120 feet. It was achieved on December 17, 1903, and it changed the course of history and reshaped the future. With courage and perseverance, these self-taught engineers relied on teamwork and application of the scientific process. What they achieved changed our world forever.